Beaugency is a commune in the Loiret department in north-central France. 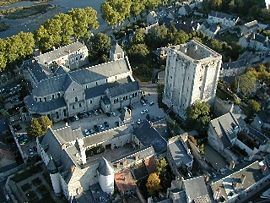 It is located on the Loire river, upriver (northeast) from Blois and downriver from Orléans. 11 March 1152 the council of Beaugency annulled the marriage between Eleanor of Aquitaine and Louis VII. Aaron ben Joseph of Beaugency was a French Bible commentator and rabbinical scholar, who flourished in the twelfth century in the city. The lords of Beaugency attained considerable importance in the 11th, 12th and 13th centuries; at the end of the 13th century they sold the fiefdom to the Crown. Afterward it passed to the house of Orléans, then to those of Dunois and Longueville, and ultimately again to that of Orléans. The city of Beaugency has been the site of numerous military conflicts. It was occupied on four separate occasions by the English. On June 16–17, 1429, it was the site of the famous Battle of Beaugency, when it was freed by Joan of Arc. Beaugency also played an important strategic role in the Hundred Years' War. It was burned by the Protestants in 1567 and suffered extensive damage to the walls, the castle, and the church. On the 8th, 9th and 10 December 1870, the Prussian army, commanded by the grand-duke of Mecklenburg, defeated the French army of the Loire, under General Chanzy, in the second battle of Beaugency (or Villorceau-Josnes). It was fought on the right bank of the Loire to the northwest of Beaugency. In 1940 and again in 1944, the city was bombed by Nazi Germany. On 16 September 1944, German Major General Botho Henning Elster and his 18 850 men and 754 officers surrendered at the Loire bridge of Beaugency to French résistance. Until 1846 Beaugency was an important commercial center due to trade along the Loire. After trade moved from the river to rail traffic, the city's role changed. Beaugency became a market center for the surrounding agricultural district. Today Beaugency's economy depends largely on tourism. ^ a b One or more of the preceding sentences incorporates text from a publication now in the public domain: Chisholm, Hugh, ed. (1911). "Beaugency" . Encyclopædia Britannica. 3 (11th ed.). Cambridge University Press. pp. 587–588. Wikimedia Commons has media related to Beaugency. This page was last edited on 20 January 2019, at 15:49 (UTC).